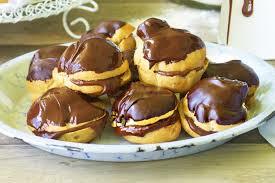 Profiteroles (chocolate and cream treats) look great, taste great and are the ultimate dinner party dessert. Give it a go, you won’t regret it! 1. Heat oven to 400° F. In a medium saucepan, combine the butter, sugar, salt, and 1 cup water. Bring to a boil, stirring to melt the butter; remove from heat. Add the flour and stir to combine. 2. Return to medium heat and cook, stirring constantly, until the mixture pulls away from the sides of the pan and a film forms on the bottom of the pan, about 1 minute. Let cool 5 minutes. 3. One at a time, add 4 of the eggs, mixing well after each addition. The batter should be shiny and smooth and hold its shape on a spoon. 4. Using one soup spoon to scoop the dough and another to scrape it off, drop tablespoon-size mounds of the dough onto parchment-lined baking sheets, spacing them 2 inches apart (you should get about 24). In a small bowl, beat the remaining egg; brush the egg over the dough. 5. Bake, rotating the sheets halfway through, until puffed and golden, 25 to 30 minutes. Let cool completely on the baking sheets. 6. Before serving, cut the puffs in half horizontally, fill with the ice cream, and drizzle with the Dark Chocolate Sauce.